Wrangler Unlimited Sahara, 4D Sport Utility, 3.8L V6 SMPI, 4-Speed Automatic VLP, 4WD, Bright White Clearcoat, Black w/Cloth Bucket Seats. Odometer is 27545 miles below market average! Reviews: * If you have a real need for all-season capability, or simply a strong desire to depart the beaten path, the 2011 Jeep Wrangler is a tough recipe to beat. And with city streets and freeways providing an increasingly unfriendly atmosphere to standard, car-based suspensions, large tires and real ground clearance are increasingly handy for the committed urbanite. 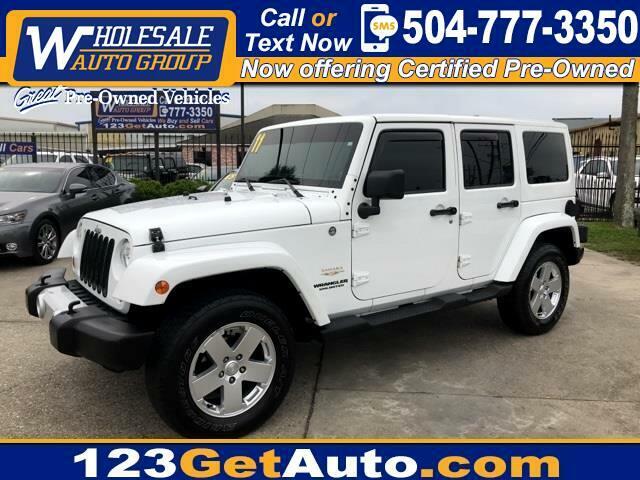 Source: KBB.com Welcome to Wholesale Auto Group Inc. We are a licensed and bonded used car dealership based in the State of Louisiana, and are located at 1337 Veterans Kenner, LA 70068. We are a family owned and operated establishment, and have been in the auto business since 1984 buying used cars and selling used cars. We are committed to bringing you the highest quality vehicles at a fair price, matched with superb customer satisfaction. Please feel free to contact us via email or by phone at (504) 777-3350. If you would be interested to view a vehicle in our inventory, please contact us and we will do our best to accommodate you. We appreciate the opportunity to assist you with your automotive needs and look forward to serving you in the future.